Homemade mayonnaise is a favorite and this summer I needed no excuse to make it. As far as I’m concerned, homemade mayonnaise is a must for my potato salad. It is also delicious when spread on a Creole tomato sandwich made with soft white bread. It gives respect to the lowly chicken or tuna salad, and it makes a simple ham and Swiss cheese sandwich a treat for lunch. My husband Rock says my mayonnaise makes his homemade pimento cheese sublime. Yep, that’s the word he uses. He also claims there is nothing better than homemade mayonnaise to perk up deviled eggs or shrimp salad with which to fill a buttery half of an avocado. And oh, what it does to a BLT. Making mayonnaise brings back great memories of my mother whipping up her own concoction either by hand (a drop of oil at a time) or with a jar-like mayonnaise mixer that had a concave lid with a small hole in the center, accommodating a wire plunger. The egg and vinegar (or lemon juice) was put into the jar, and the oil was dripped in, a little at a time, while the plunger agitated the mixture until it emulsified. A few years ago, a reader called me to tell me he had such a gadget, and in fact had several since his father had at one time been a salesman for the Wesson Oil Company. He graciously sent me three. A few weeks ago, one of my great nephews came for a visit while I was making a batch of mayo with my mayonnaise mixer. He was shocked that we were making mayonnaise from scratch since he mistakenly believed the stuff only came in a jar from the supermarket. He gleefully slathered some of the finished product on his ham sandwich and declared it amazing. Of course, mayonnaise can be easily made in a food processor or electric mixer, thus making it even easier to indulge in the tart, creamy condiment. 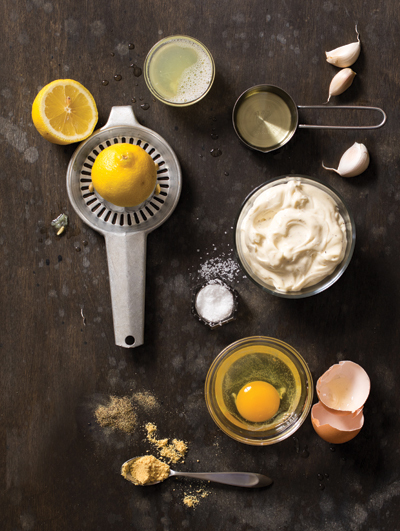 As we bid farewell to summer, you might want to have a fling with your own batch of homemade mayonnaise. One word of advice: since the mayonnaise is made with raw eggs, it’s best to use it within 48 hours, and the elderly and very young children should avoid it. In an electric blender or food processor blend the egg and the vinegar or lemon juice for about 30 seconds. Add the sugar and pulse a couple of times. With the processor running, slowly pour the oil through the feed tube. The mixture will thicken. Season with salt and pepper and pulse once or twice to blend. Transfer to an airtight container and refrigerate for at least 30 minutes before using. In a blender, put the egg, lemon juice, mustard, sugar, salt, black pepper and hot sauce and blend for 30 seconds on high speed. Then with the motor running, pour in the oil in a slow, steady stream. The mixture will thicken as the oil is added. If you like, you can add two cloves of crushed garlic, or finely chopped fresh herbs to give the mayonnaise an added spark. Store the mayonnaise in an airtight container in the refrigerator until ready to use. If you want to walk on the wild side, try this mayonnaise flavored with a bit of Calvados, the French apple brandy, and slather it on cold pork or beef tenderloin tucked into slices of crusty French bread. Have a clean bowl with a rolled towel wrapped around the base to prevent it from skidding around as you whisk. Whisk together the egg yolk, mustard, vinegar and salt. Whisk in the oil, drop by drop, gradually increasing it into a thin stream until the mixture thickens. Gently whisk in the Calvados, lemon juice and pepper to taste. Store in the refrigerator until ready to use. When I have an abundance of homegrown tomatoes, this is a real treat. This salsa mayonnaise is delicious with shrimp, grilled chicken or fish. Combine all the ingredients in a glass bowl and mix. Fold in the mayonnaise. Chill until ready to use. This is an easy and delicious recipe for an appetizer. Bring a large pot of water to a boil. Add the lemon, salt, and cayenne. Add the shrimp and return the water to a boil. Remove from the heat, cover and let stand for 5 minutes. Drain and spread the shrimp on a shallow platter to cool. Refrigerate until completely chilled. Combine the mayonnaise, shallots, curry, mustard, and vinegar in a bowl. Whisk to blend. Season with salt and pepper. Put the shrimp in a large bowl and add the curry mixture. Toss to coat evenly. Serve immediately or store in the refrigerator until ready to use. Serve with party crackers or thin slices of toasted French bread. This is simple but tasty recipe for an appetizer. The word “ravigote” comes from the French word “ravigoter, which means to invigorate. The sauce pairs well with shrimp, crabmeat and lobster. Combine ¼ cup finely chopped parsley, 2 tablespoons finely chopped green onions, ½ cup capers, drained, ½ cup mayonnaise, ¼ cup Creole mustard, 3 tablespoons fresh lemon juice, 1 tablespoon Worcestershire sauce, 1 teaspoon prepared horseradish and hot sauce to taste in a bowl and stir to blend. Store in an airtight container and refrigerate until ready to use.